Introduce the topic of energy conversions and photochemical reactions with this bright and fun demonstration. Simply place the thionin solution on an overhead projector and watch the deep purple color quickly change to colorless. Remove the light and the solution will slowly return to its original purple color. 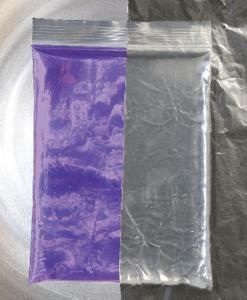 You can also cover half the bag and watch only half of the bag change color.